Technology Guide: Zenith's Low Cost PC, Laptop : Laptop Starting With 14, 999. 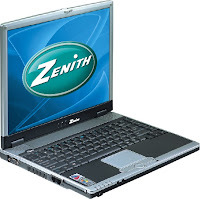 Zenith's Low Cost PC, Laptop : Laptop Starting With 14, 999. Indian personal computer maker, Zenith Computers, on Thursday, unveiled a new laptop priced at Rs 14,999 and the desktop PC for Rs 11,999. Company claims that these brands launched under the brand name ‘EcoStyle’, are free of any toxic materials and the consumption of energy is also less as both the computers on an average, consume 30% less power. Both the products are vailable with Windows Vista and Microsoft XP home edition through a tie up with the Microsoft. The company claims that EcoStyle laptop priced at Rs 14, 999, will be the lowest priced Windows OS enabled laptop in the market. Zenith’s manufacturing facility at Goa, which produces 20,000 units a month, is planning to increase the capacity by another one thousand, the company said. Raj Saraf, CMD, Zenith Computers, said the newly launched, low cost laptop, will cater across all the segments, including the students and educational institutions in particular. “This initiative is a part of our continuous effort to foster advanced and hassle free computing experience. With the EcoStyle PC, Zenith is bringing a true low-cost PC which underlines performance and affordability for the consumers he added,” he added. When asked, if the economy reeling under the global slowdown, along all the industry verticals, will have enough takers for the laptops, Saraf positively asserted, “I don’t see any impact of slowdown as the penetration of PCs in the country is still very low”.